I have nearly finished the installation. I have had the tub working and can report that I am very pleased and it works well. The pipes supplied were too short to allow it to be connected at a right angle but it was easy to source some more. 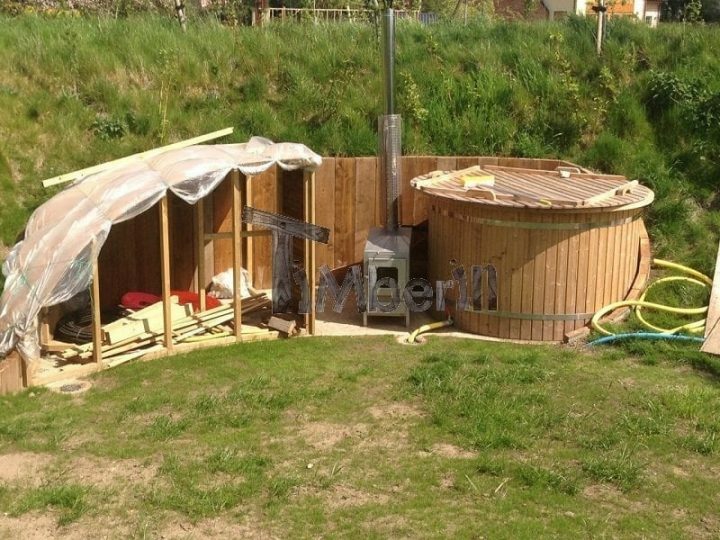 The area I have put the hot tub in has required a lot of landscaping and some building work so I can supply pictures now but I would suggest that is about two weeks the whole are will look green again and the building work will be completed and hence make a much better picture! Let me know if you are happy with this, otherwise I can photograph as is? Sorry for the delay. Please find attached a picture of the hot tub as it is. The area around it does at least now look green but as you can see there are still various bit to finish. I hope this is of use and I will send some more when it is completed in a few more weeks (steps, water, building next to it) when hopefully it will show it off much better.